This evening we had a birthday dinner for a friend. The menu included a special green salad, ciabatta rolls, steamed broccoli, Giada’s butternut squash lasagna and Chardonnay. For dessert we had carrot cake. Of all the carrot cakes I’ve made, this was probably my favorite. It wasn’t as ultra-moist as some others, but it wasn’t a cake I’d call “dry” either. It had a kind of crumbliness to it that I liked, plus a ton of flavor from the browned butter, dark brown sugar, cinnamon and pineapple. Here’s the recipe. It’s (loosely adapted!!) from Cook’s Illustrated, but I typed it up as I made it (which means lots of changes) and I used a different frosting than CI. Preheat oven to 350 degrees F. Spray two 9x2-inch round metal cake pans with flour-added baking spray. If you are using dark cake pans, preheat the oven to 325 degrees F.
Shred carrots. Toss them with the 1 cup granulated sugar and place in a colander set over a large bowl. Let sugared carrots sit for about 20 minutes to drain. Press occasionally, draining out liquid until you've collected 1 cup (no need to keep it, just throw it out). Meanwhile, melt butter in a saucepan set over medium heat. Cook it until it develops a nutty aroma and starts to turn brown right around the edges. Pour the browned butter into a mixing bowl and let it cool for 2 minutes. Add the dark brown sugar to the butter and stir well. Stir in eggs, one by one, then stir in vanilla. In another bowl, stir together the flour, baking powder, baking soda, salt and cinnamon. Add the flour mixture to the butter mixture and stir until incorporated. Stir in the sugared carrots, drained pineapple, walnuts and raisins. Divide the batter evenly between the cake pans and cook for 40-50 minute or until the cakes test done. If using two racks, switch racks halfway through so that both cakes cook evenly. Note: My cakes were done in 40 minute and I used dark pans and 325 degrees F, so check at 40 minutes. Cool the cakes on a rack for 10 minutes, then turn from pan and cool completely. Prepare icing. Beat together cream cheese and butter. Stir in sugar, vanilla and lemon juice. If you'd like some extra tartness, stir in a bit of sour cream. Beat until light and fluffy. Frost cake. I’m so happy to hear you liked it! If you’re up for trying another recipe, I recommend this one. It’s moist, but not quite as heavy as some carrot cakes. I’ve only made it in cupcake form, though. Also, I use oil. If you want it to have a lighter texture, use melted butter in place of half of the oil. And I have yet another cake in mind for you to try, but I’ll have to email you the full recipe. And finally, it occurred to me that if you want a lighter cake then you should consider using a butter based recipe instead of one with oil. Thank you for the speedy response and advice. I’ll definitely try it out. Thank you so much! It’s hard finding the perfect carrot cake because there are so many different ways to make it. To convert the weight ounces to grams, just multiply every 1 ounce by 28 (224 grams of butter, for instance). To halve the amount of eggs, use two whole eggs, then crack the third egg into a bowl, stir it around with a fork and use about half of it. If you are using very small eggs, you could probably use 3 whole eggs, but the eggs I used were large, so 2 eggs plus half an egg (about 2 tablespoons) works best. I’m interested to try out your carrot cake recipe for my hubby’s birthday. I’ve been on the search for a carrot cake with a cake like texture rather than the famous moist n dense ones and as you mentioned yours is neither ultra moist nor dry I think it fits what I’m looking for. I’m going to hv a trial out before baking the double layer cake for his birthday so if I half the recipe do I use 2 or 3 eggs? Also do you think it possible if you could convert the amts to grams? I suppose I could Google out the ounces to grams as well? Good question. I’ve tried it as cupcakes and in my opinion, they’re too muffin-like. 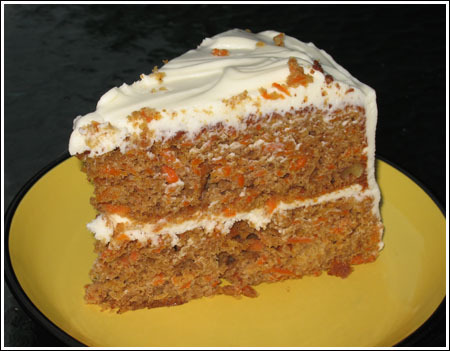 The recipe is great for a big cake, but for carrot cupcakes, the Silver Palate recipe or the Commissary recipe wins. I wonder, if this recipe is applicable for cupcakes mould. Or just for big size of cake. I halved this recipe and baked it in an 8×8 pan for about 30 minutes. My boyfriend loved it so much I made it twice in the past week to use up the whole pound of carrots I bought. This is definitely a keeper! So I made this in a 9 x 13 pan and cooked it for 40 minutes and it turned out great. It was moist and very flavorful. I loved the textures of the pineapple and nuts. You couldn’t taste the pineapple but you could still tell it was there. Excellent recipe, thanks! So I am actually going to make the carrot cake, NOT the lasagna. Any tips for cooking time if I make this in a 9 x 13 pan? I just made this up on paper and have no idea if it will actually work, but I think it would. This is a lower fat version of the lasagna. It uses sage instead of basil. If you wanted to keep the basil theme going but not use the processor, you might try adding a tablespoon or two of pesto (though that would up the fat a bit). I am going to try this version one day this week. The original version had about 22 grams fat per serving and this one is closer to 13. The evaporated skim milk really makes a difference in that department, but I’m not sure how it will taste. Spray a 13×9 inch baking dish with cooking spray. In a saucepan or mixing bowl, stir together the thawed squash, bread crumbs, amaretto, salt and pepper. Set aside. Spread 3/4 cup of the sauce over the prepared baking dish. Arrange 3 lasagna noodles on the bottom of the pan. Spread 1/3 of the squash puree over the noodles. Sprinkle with 1/3 cup of mozzarella cheese. Drizzle 1/2 cup of sauce over the noodles. Repeat layering 3 more times. Tightly cover the baking dish with foil and bake the lasagna for 40 minutes. Sprinkle remaining mozzarella Parmesan cheeses over the lasagna. Continue baking uncovered until the sauce bubbles and the top is golden, 15 minutes longer. Let the lasagna stand for 15 minutes before serving. I am obsessed with that lasagna today. That is, I can’t figure out why people love the recipe so much. Now it was very tasty, but not the greatest lasagna in the world and with all that work involved, you’d expect it to be! My guests loved it, but I was disappointed in the presentation (too flat, but maybe that’s a traditional Italian thing) and the fat/calories are way too high — not something I’d eat on a regular basis, since I save my fat calories for dessert. But that’s just my personal opinion and Giada is a great cook. She has tons of other recipes that are lighter and more streamlined. And anyway, I guess there’s nothing wrong with this one since it was a hit with guests and in the end, that makes the work involved worth it. I think the next one I’ll try is from Cooking Light. There’s one on their recipe finder from 2004 which has less fat and more veggies. I have a good carrot cake recipe too but I like the idea of browning the butter — sounds more flavorful. I’ve never ‘sugared’ my carrots before either — I like that idea as well. Can’t wait to see the picture! Debbi, I am impressed at how thoroughly you read that recipe. The step where you take half the sauce and put it in a blender is a little odd. I did make the recipe, but instead of putting half of the sauce in a blender, I spooned out about a half cup and put it in the processor with the fresh basil. I think the basil needs a little liquid in it to make a smoother puree. Adding some sauce to it takes care of that problem. Still, I wouldn’t want to pull out a food processor AND a blender. Other than that, I followed Giada’s recipe. Did you make the squash lasagna? What is an amaretti cookie? And I don’t get the transferring 1/2 the milk sauce to a blender? What is that doing to it? The carrot cake looks delicious too. I use my mother in laws recipe which is awesome. I should make her this one and see if I get the seal of approval from her!